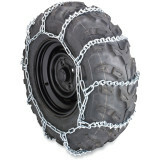 William - Upstate, NY Moose ATV Chains - AAAAA +++++ "As described, easy to install on my 2007 Rancher. Used them yesterday on the ice for fishing. Steering slow to respond (on glare ice) as I only have them on the back. I may consider a set for the front too - they're great and required no re-adjusting, so far." Hank - Alfred Maine Need Better tire size formula needed "Bought these for a Honda Rincon with 25 x 10-12 and were too big( I bought the Large as that is what was suggested) . The chains are really well built(better than the ones I ended up buying locally) but just didn't fit as they were overlapping the rims(inside and outside) and within fractions of shock on inside. 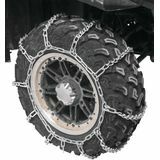 Would definetely buy if could get the right size(Best built chains I've seen)"